VisionFund (VF), a microfinance organization in Zambia, decided to change the way in which they disbursed loans to their clients. Instead of disbursing loans through checks, which clients then had to cash at a bank, VF decided to use an electronic payments provider called Zoona. 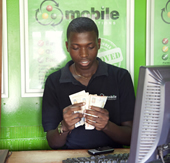 Microcredit clients could now go to designated Zoona agent shops to receive their loan disbursements in cash. However, migrating clients to use this new e-payments platform presented challenges. Clients did not understand all the steps required to use the service, or the information they received in SMS messages containing instructions and PIN numbers. To address these challenges, MFO, Zoona and VF planned a new financial education (FE) program for VF clients. The objective of the program was to help VF clients adjust to using this new technology platform as well as to improve their financial capabilities around debt management, saving and budgeting.